Un- Explored & Fresh destination in Central Asia. Best for family travel (due to close cultural relationship & Rich Landscape). One of the best lake resorts in Central Asia (Lake Issaykul - which means in local language warm water lake). New Aircrafts (Boeing 737/800- 189 seating capacity). 100% Satisfaction & value for money. Covering letter on the Agency letter head or the Sponsoring company letter head, as per the format provided by our sales office. Visiting card in case of the FIT. 2 Passport size photographs in white background. Passport with 6 months of validity. Normal group tourist visa requires min 5-7 working days. Urgent group tourist visa requires min 2-3 working days. 16:10 hrs on your arrival at Manas Airport (Bishkek, the capital of the Republic of Kyrgyzstan, located in the Chui valley at the northern foot of the Kyrgyz Ala-Too on an inclined plain, at an altitude of 700-900 meters above sea level). 17:00 hrs Meet & Greet Service outside of arrival hall. Transfers to the Bishkek City Hotel about 40 Kms from the Airport. 18.00 hrs check in the Bishkek Hotel, fresh and change. 20:00 hrs Transfer to the Indian Restaurant for Dinner. (Night owls will love Bishkek. Locals and every Bishkek guide will be quick to point out that the city has the most thriving club scene in Central Asia (second only to Almaty). 10.30 hrs move for the Panoramic City & Shopping Tour – ("Bishkek" means a stick for beating koumiss - the national drink of sour mare's milk. Bishkek - one of the major cities of Central Asia and the largest city in Kyrgyzstan with a population of over 800,000 people, the multinational city with over 80 nationalities. The main language of international communication is Russian). 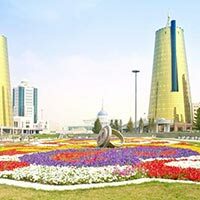 You will visit Ala Too Square, Opera and Ballet Theater, Stat History Museum, Fine Arts Museum, World National Library and Osh Market. (The bazaar is a fun place to shop because the food is fresh and the clothes are cheap! You will love going to the bazaars in Bishkek, and it’s even more fun if you get yourself into tri-lingual conversations. Just be prepared to have to haul your goods back home afterwards). 13.30 Hrs Lunch at Indian restaurant. 14.30 Hrs Transfers to Ala-Archa Nature Park 35 km from Bishkek. (Ala Archa means "bright juniper", and indeed there are juniper bushes growing all through this beautiful gorge. The area is stunning, probably best described as Alpine; abundant with wild flowers, bubbling mountain streams, glaciers and vast mountain panoramas. It's a great spot to do a bit of hiking as most of the canyon is protected as part of a Krgyz National Nature Park. The Gorge itself is 35 kms long and the surrounding mountains are massive, home to some of the largest glaciers in all of Kyrgyzstan). 07.00-10.00 Enjoy buffet breakfast at your hotel. 10.30 Check out from hotel and transfer for Issyk kul lake resort Approx 4.5 Hours drive / 260 Kms. 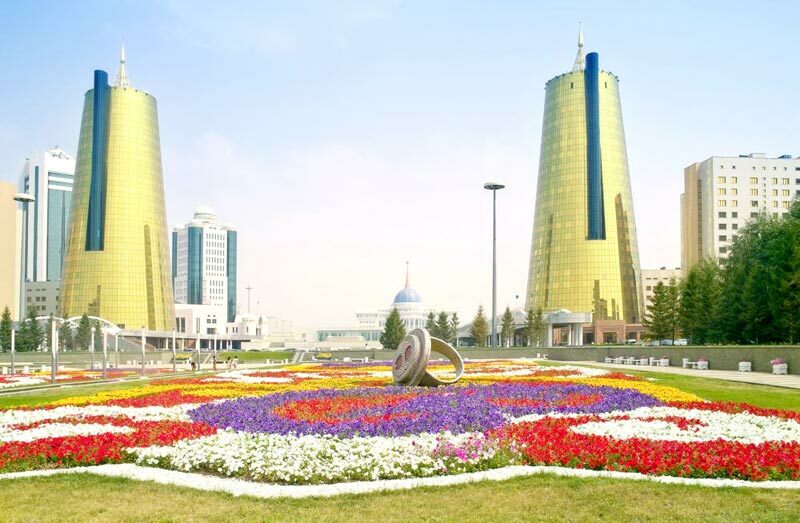 On the way visit cultural complex Burana Tower (X-XI cen. )(The tower is all that remains of the ancient city of Balasugan, at the entrance to the Shamshy valley. Established in the 10th century on the site of an older settlement, the city was the birthplace of the poet, Jusup Balasugyn). Enjoy view of wonderful mountains and life of local people. (Issyk-Kul is the largest region of Kyrgyzstan and its most popular tourist destination. The region is situated around Lake Issyk-Kul, the world's second largest brakish water lake which is 1600 m above sea level, 170 km long, 70 km wide and 695 m deep. "Issyk-Kul" means "hot lake" in Kyrgyz, as it never freezes. The mountains and the marine microclimate produce a wild, unique environment. The mountains surrounding the lake are a shelter for very rare animal species (snow leopard, cutter-loader, wild boar) and plants, such as the Tyan-Shan fir. The lake and the surrounding resorts are a replica of the goa for the region in plain words. Full of all sort of fun for all age segments including a very compelling night life). 13:00 hrs Lunch at the Local Restaurant en route to Issyk Kul. 17:30 hrs Check-in to the Resort at ISSYK KUL Lake. Rest in the resort center on the shore of the Issyk- Kul Lake Time free till Dinner. 20:00 hrs Indian Dinner (Time free for Night Life activities on your own at local famous clubs and discos. )Night Stay at Resort at ISSYK KUL Lake. 08.00-10.00 hrs Enjoy buffet breakfast at your resort coffee shop. 10.30 Proceed to the cultural complex Ruh Ordo and Petroglyphs on open air in Cholpon-Ata (Issyk Kul) (The Ruh-Ordo Tashkul-Ata Cultural Centre, on the northern shore of Lake Issyk Kul was commissioned in 2002 as a cultural “theme park” to commemorate and celebrate the historical heritage of the region). (The region around the lake is stunningly beautiful and is great for anyone who loves the outdoors. Hiking is superb is the hills and mountains around, on the lake itself you can sail, surf, row, scuba dive and fish and for the more adventurous there are always activities like helicopter skiing). 13:30 hrs Lunch at the Resort Restaurant. 14.30 18.30 you can enjoy time (on your own) Fishing, kayaking, swimming, surfing, diving, paragliding, riding on water bikes, catamarans or probably having beer with famous fried Fish. 07.00-09.30 hrs Enjoy buffet breakfast at your resort coffee shop. Time free for leisure activities on the beach at ISSYK KUL Lake. 12:30 hrs Lunch in the Resort Restaurant. 13.30 Checkout from Resort, Drive Back to Bishkek, on the way enjoys view of wonderful mountains and life of local people. 19.30 Transfers back to Manas International Airport with everlasting memories of Kyrgyzstan. (One Bottle of mineral water for each pax in Bus).